Should I Buy A Used Motorhome Built By An RV Manufacturer That Is Out Of Business? 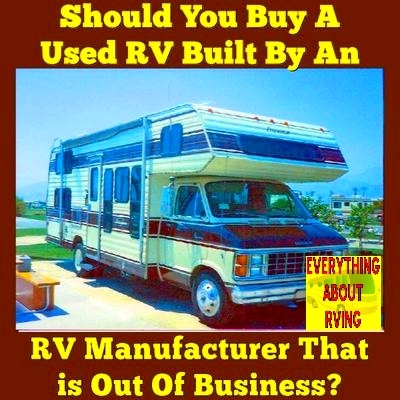 Should You Buy A Used Motorhome Built By an RV Manufacturer That is Out Of Business? What are the pros and cons of purchasing a 4-year-old Class A when the company is no longer in business? Can it still be repaired, parts purchased, etc.? Thanks bunch! ANSWER; An RV whose manufacturer is no longer in business is known as an Orphan RV. The only problem you will have finding parts for your orphan RV will be exterior body parts, such as the front and rear caps of the motorhome, storage compartment doors (sometimes), etc. Most of the other appliances, equipment, etc. that are used in most RVs are standard parts and are readily available. So, yes your motorhome can be repaired even though the manufacturer is out of business. Important: You should also base your decision on the condition of this used RV. You should either have someone perform a used RV Inspection on the unit or if you are comfortable you can do it yourself. Please visit our Used RV Inspection Page for guidelines on the important areas and items that should be inspected on a used RV. you like the floor plan and it is in the right price range for you then I would not hesitate in purchasing it. I should note here that the manufacturer of our current motorhome is no longer in business. Luckily our motorhome was already out of warranty when the manufacturer went belly up. I have yet to have any problems getting parts or service on my motorhome. One thing you might want to consider after buying your motorhome is whether you want to also purchase an Extended Service Plan to help offset the cost of any future repairs. Rest assured that there are thousands of RVers right now that own Orphan RVs (nickname for an RV whose manufacturer is no longer in business) and the majority of them have not been affected by the demise of the manufacturer. The only ones that were affected are the ones who bought their RVs new and the manufacturer went out of business prior to their new RV's warranty expires. The day the manufacturer went out of business; they lost their warranties. I hope that the above information has been helpful to you. If any of our visitors have information they would like to share with you they can add that information to this page by clicking on "Click Here To Post Comments" link located near the bottom of this page. Comments for Should I Buy A Used Motorhome Built By An RV Manufacturer That Is Out Of Business? We currently own an Orphan. It has not affected our life in the least that our manufacturer went out of business. We also happen to be shopping for a used Diesel Pusher, and have three or four manufacturers in mind that we would prefer to purchase. Again, it will not matter to me if they are out of business. The engine, chassis, drive train, etc, can all be serviced by the manufacturer of those components. . . same for the fridge, water heater, etc.